Photoshop Elements 6 offers numerous tools you can use to look at and manipulate images in your computer. This photo and list walk you through the basics. 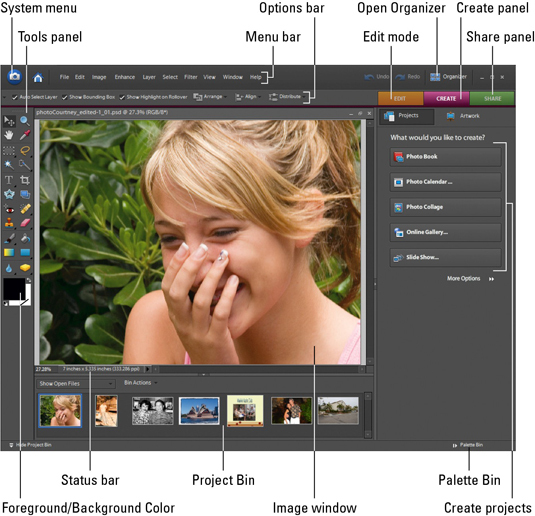 Open an image in the Elements Full Edit mode by choosing File, Open. Get information about your image by looking at the status bar. Click the right-pointing arrows to get more editing options for your document. Need to see detail in your image? Zoom into your image by pressing Ctrl+spacebar and clicking. Zoom back out by pressing Alt+spacebar and clicking. Easily switch between open documents by clicking images in the Project Bin. Access panels as needed by choosing them from the Window menu or the Palette Bin. Show files from the Organizer by selecting options in the Show Open Files drop-down menu in the Project Bin.